Yesterday Ontario's Peel Regional Police and Coca-Cola held a joint press conference to promote their new partnership - one that will see police officers in Peel hand out coupons for Coca-Cola to drivers who haven't been drinking and driving. Given the awareness and illegality surrounding drunk driving, the likelihood that this "partnership" will lead those who were otherwise considering driving drunk to not do so is low at best. What that means of course is that this is a partnership that only benefits Coca-Cola who in turn receive the incredible opportunity of having a police force freely serving as respected, trustworthy, brand ambassadors. By involving themselves in causes like this one, causes that are themselves beyond reproach, Coca-Cola secures powerful, and virtually free advertising, while accumulating public relations victories that they can use when trying to convince politicians that soda taxes are bad ideas. A great move for Coca-Cola, with pretty much nothing in it for Peel. 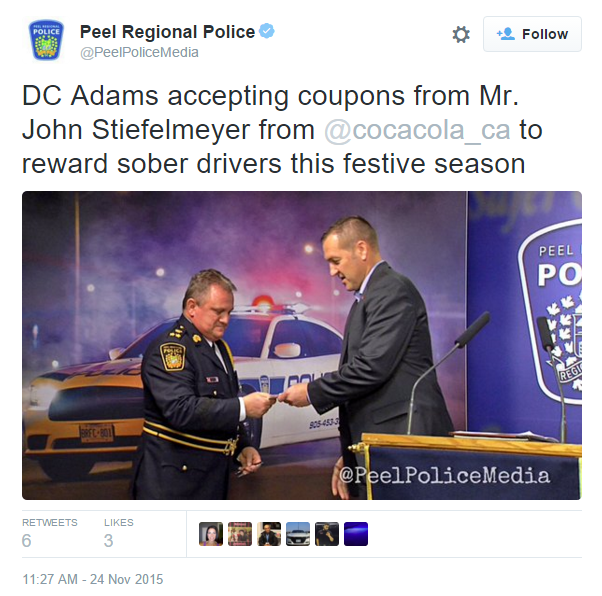 Unfortunately, though it was there before, the Peel Regional Police have apparently removed the video of their joint press conference with Coca-Cola.